Facebook has proved to be an efficient means of political communication between citizens and politicians. On this virtual stage, political actors display their competence, consolidate their fame, mobilize their volunteers and attack their political opponents, encourage donations and debate some sensitive issues of the society. Citizens have the chance to get informed, to organize and to mobilize themselves for different causes or candidates, to participate in different events or elections campaigns. Our study will analyze the use of Facebook during the campaign for the impeachment referendum (July 29, 2012). The analysis will focus on the posts made both by the pro-Băsescu citizens and by those that are against him. The research questions addressed will focus on: (a) the types of information posted by both opposite groups; (b) the degree in which the Facebook accounts are used for acclaims, attacks, or defenses; (c) the time span during the campaign in which” the dialogue” between the two groups gets more intense; (d) the degree of interactivity between those who post the information and their” friends”. The research methods are functional analysis and content analysis. The two opposing groups sent their messages by the use of photographic images, verbal texts and advertising images. They used more attacks than acclaims, and had an intense activity during the middle and the end of the campaign. Their Facebook pages were interactive allowing the posting of appreciations, comments and the distribution of the materials posted. Some of the results presented in this study were also published in Pătruţ M., “Pro şi contra suspendării preşedintelui. Referendum pe Facebook”, (For and Against Impeaching the President. 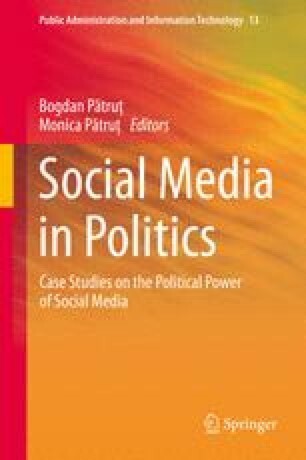 Facebook Referendum) in Sociologia Românească, 1, 2013: 29–35. Andrei, C. (2012). Cele şapte motive ale suspendării preşedintelui Traian Băsescu. Ce conţine documentul USL. Available at http://www.gandul.info/politica/cele-sapte-motive-ale-suspendarii-presedintelui-traian-basescu-ce-contine-documentul-usl-9813858. Accessed 15 Jan 2013. Boşoteanu, I. C. (2011). New media in alegerile prezidenţiale din 2009. Sfera Politicii, 8(162), 47–56. Available at http://www.sferapoliticii.ro/sfera/162/art06-Bosoteanu.php. Accessed 7 Jan 2013. Ciocotişan, F. (2011). Cine este cel mai tare politician de pe Facebook? Available at http://impactnews.ro/Politic/Cine-este-cel-mai-tare-politician-de-pe-Facebook-48577. Accessed 15 Jan 2013. Cozma, R., & Chen, K. J. (2011). Congressional candidates’ use of Twitter during the 2010 Midterm Elections: A wasted opportunity? Lucrare prezentată la. International Communication Association Annual Conference, Boston. Available at http://www.allacademic.com/meta/p490948_index.html. Accessed 17 Jan 2013. Dinu, C. (2012). Referendum 2012. Rezultate finale Biroul Electoral Central. Available at http://www.gandul.info/news/referendum-2012-rezultate-finale-bec-prezenta-la-vot-46-24-pentru-demiterea-lui-basescu-au-votat-87-52-iar-impotriva-11-15-9913998. Accessed 20 Jan 2013. Momoc, A. (2010). Online negative campaign in the 2004 Romanian presidential elections. Styles of Communication, 2(1), 89–99. Available at http://journals.univ-danubius.ro/index.php/communication/article/view/735/667. Accessed 19 Jan 2013. Momoc, A. (2011). Candidaţii populişti şi noile tehnologii (Blog, Facebook, YouTube) în alegerile prezidenţiale din 2009. Sfera Politicii, 8(162), 39–46. Available at http://www.sferapoliticii.ro/sfera/162/art05-Momoc.php. Accessed 15 January 2013. O’Neill, N. (2008). The Facebook election results. Available at http://allfacebook.com/the-facebook-election-results_b2089. Accessed 20 Jan 2013. Pătruţ, M., & Cmeciu, C. (2010). Dezbaterile electorale—un joc discursiv ritualic. Sfera politicii, 3(145), 57–63. Available at http://www.sferapoliticii.ro/sfera/145/art09-patrut_cmeciu.html. Accessed 10 Jan 2013. Westling, M. (2007). Expanding the public sphere. The impact of Facebook on political communication. Available at http://www.thenewvernacular.com/projects/facebook_and_political_communication.pdf. Accessed 15 Jan 2011.